The Quake contesters after getting set up for the 2013 CQ WPX SSB contest. Looking about 60 degrees north under the the watchful gaze of the guys for the 80m delta loop. 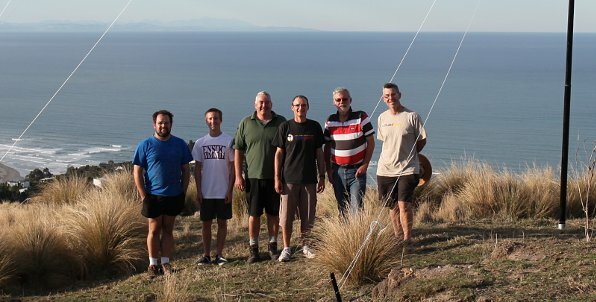 In the photo and operating for this contest are Chris ZL3LF, Byron ZL3DXT, Don ZL3DMC, Mark ZL3AB, Phil ZL3PAH and Geoff, ZL3GA.